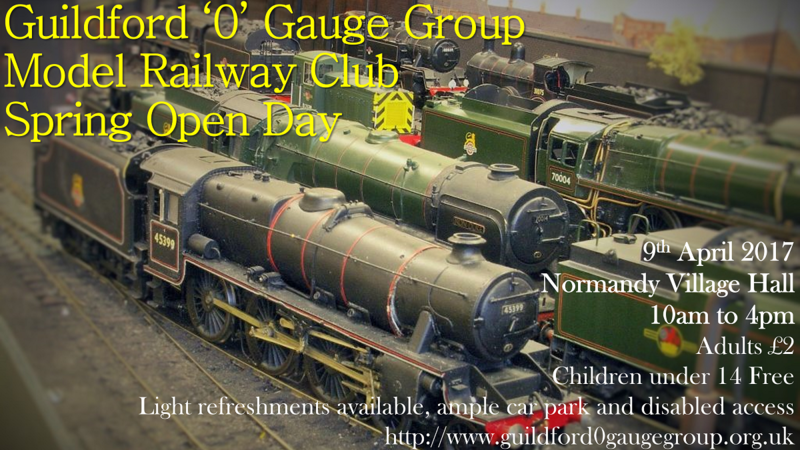 Guildford ‘0’ Gauge Group is a model railway club that has been running for more than 30 years and has been a permanent resident of Normandy’s village hall, except when we had to move to temporary accommodation when the original village hall was demolished and we had to await completion of the new hall, which is where we are today. We have a regular Monday night meeting and test track running which is interspersed with setting up the main layout in the large hall on selected dates. We also have our own club room which has a workshop area where we can carry out maintenance and repairs to the layouts and develop new projects. 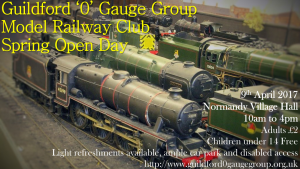 The main layout is on show to the public in the village hall three times a year, which comprises a spring and autumn open day and attending Normandy Village Fete. The next open days this year is on Sunday, 9th April 2017, from 10am-4.00pm. If anyone has an interest in 7mm modelling or would like to know more about the hobby, you are most welcome to come to one of our Monday night meetings from 7.30pm onwards. Or you can contact our secretary at his e-mail address at cross406@btinternet.com or by telephone – 01428 729201.